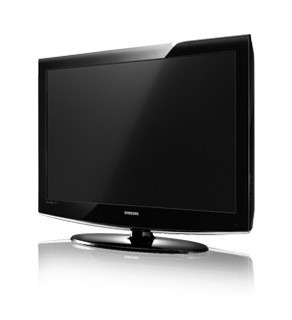 With a design that is simply refined, the SAMSUNG LCD TV SERIES 4 delivers delight to your eyes. Its slim style refreshes your living space and uplifts your emotions, creating entertainment that is more enjoyable. Its pristine picture quality offers an outstanding HDTV experience that redefines how you connect to the digital world. In 2007, SAMSUNG's Wide Colour Enhancer extended to display the natural green and blue. Additionally, Wide Colour Enhancer 2 technology is upgraded to reproduce the red area as well. Three High Definition Multimedia Interface (HDMI) connections make your TV a multimedia centerpiece. Connect HD digital devices like disc players, game consoles, and satellite dish components into the 2 rear connections and use the side-mounted input for cameras, camcorders, and laptops. HDMI is the best performing interface for displaying an HD source on an HDTV. The more colour there is between the darkest and the brightest, the higher the contrast ratio will be. The dark colours will be darkest at best. SAMSUNG's LCD TV achieves the Highest Contrast Ratio (Dynamic Contrast). Enjoy life through SAMSUNG LCD TV via the Entertainment mode.